Many homeowners have concerns with water flowing in through exterior doorways, stairways, and garage door openings. A normal drainage system cannot address this problem. 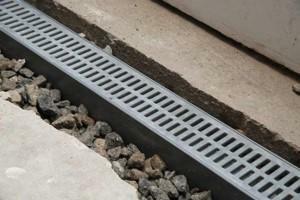 For these situations, we recommend the TrenchDrain™ drain channel and grating system. To schedule a free drainage pipe installation quote, call us today at 1-844-311-8051 or contact us online. We offer all our basement waterproofing services in Seattle, Portland, Tacoma and the nearby areas. The TrenchDrain™ is the ideal solution for leaks around doorways and garages in any home. TrenchDrain™ is specifically designed to intercept water at doorways and similar openings and direct it to your sump pump. This system resembles half of a piping system with a grate fitted snugly on top. The grate is flush with or slightly below the floor, where it can catch water entering from the outside. If you're tired of dealing with flooding through the doorways of your home, the waterproofing experts at TerraFirma can help. Call us today at 1-844-311-8051 or contact us online for a free installation estimate for one of our basement drain systems in Seattle, Portland, Tacoma, Vancouver, Bellevue, Eugene, Renton, Hillsboro, Salem, Gresham and the nearby areas.